Thousands of people across the world have joined together in a global movement, protesting against American biotech giant Monsanto. Activists from over 400 cities are speaking out against GMOs and Monsanto’s monopoly over the food supply. 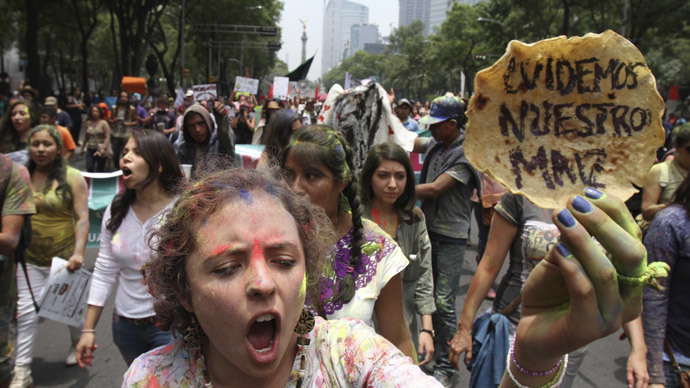 Saturday marked the third global annual March Against Monsanto (MAM). According to the organizers, 48 countries were scheduled to participate in a massive global turnout. Click here to see a map that shows where the protests are taking place around the globe. A total of 452 rallies have been registered with the MAM organization. Activists accuse the agricultural corporation of selling toxic chemicals, which are bad for people’s health, water supplies, vital crop pollinators and environment in general. The giant is also criticized for its attitude towards food safety regulations and a staunch opposition to GMO labeling. Meanwhile, small farmers blame Monsanto for monopolizing the seed market. There were also great turnouts at rallies in Asia, Africa, and Europe. Demonstrators in Bangladesh formed a human chain around the faculty of fine arts at Dhaka University in the country’s capital. In India, thousands of farmers suffering the monopolistic push of the biotech giant have been protesting against Monsanto. A documentary on the rising suicide rates among Indian cotton farmers struggling to reap profits after GMO cotton replaced their crops is coming soon on RT. Meanwhile, crowds of activists in South Africa braved the rainy weather in Cape Town during their march against genetically engineered products. In France over 20 cities participated, with some central Parisian streets coming to a complete standstill. France is one of the biggest markets for Monsanto. Germany’s capital Berlin saw a big turnout even though Germany does not use Monsanto’s seeds. However, activists say local farmers still use Monsanto’s pesticides and herbicides, which end up leaving traces in breast milk of feeding mothers, the water supply and even urine of people who have not eaten GMO products. “The changes to the food supply are irreversible. And that is for the rest of human history. 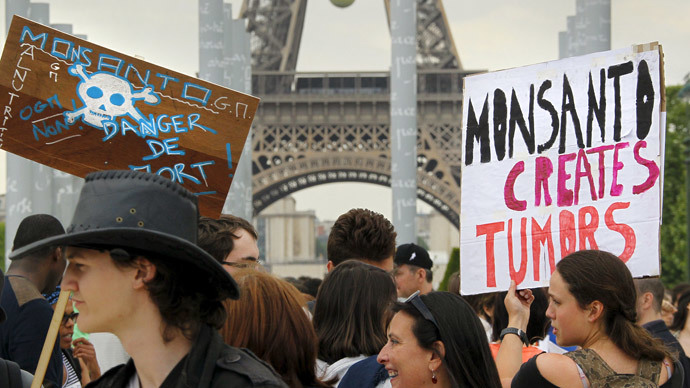 We are losing choice because it will all become GMO,” protester in Paris, Heidi Osterman, told RT. “I think the general population will not wake up until they realize that they are getting seriously ill from this,” activist and Vice President True Food Foundation, Dietrich Wittel said. Demonstrators in London, UK said they are concerned with GMO crops taking over their island given its isolation and size, which can potentially encourage a faster ‘takeover’ of GM crops. “What we believe is that GMOs are untested. These kind of pesticides and fertilizers infects our food and is going to affect us in a very negative way. This is why we profoundly disagree with GMOs,” a protester at the London rally told RT’s Laura Smith. A wave of marches against Monsanto and GMO food hit the United States. Among the cities to join the protests were New York; Washington, DC; Los Angeles; San Franciso; Chicago; Indianapolis; Portland, Oregon; Oakland, California and dozens of others. Activists decried Monsanto’s control of 90 percent of the US seed market. Hundreds of protesters marched on the White House and Monsanto’s Washington, DC headquarters as part of the anti-GMO action. People in New York also seized the opportunity to voice their concerns. Chicago protesters have marched against Monsanto and GMO food, blocking off traffic in several streets. “Monsanto is the reason why GMOs are in most of our food and we are one of the countries that haven’t banned them. It is a really big deal and people need to speak out in order to make a change,” a protester from New York told RT. One of the central issues in the US is the battle over labeling GMO products. “Our biggest concern is that they are not labeling to begin with,” another activist stressed. Demonstrators from the city of Kelowna in British Columbia, Canada, shouted: “Hey hey, ho ho, GMOs have got to go!” Protesters in London, Ontario, Canada shouted they want “Real food” – and that they want it “now!” Ontario beekeepers have also symbolically dumped a coffin full of dead honey bees, which they gathered from farms across the province, CBC News reported. 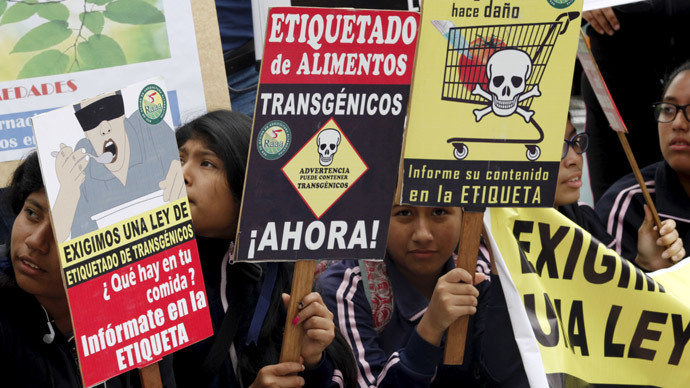 South America has seen powerful anti-GMO protests with some striking imagery on placards carried by demonstrators. Many protesters chose to stress they believe Monsanto’s pesticides and genetically modified products have been causing neurological diseases and cancer. Protesters in Brazil dressed up in gas masks and white uniform, carrying anti-Monsanto signs seemingly covered in blood. In Buenos Aires, Argentina, Guy Fawkes masks and placards against the biotech behemoth mixed with demands for green and real food. The first annual MAM action was held in 2013. It saw over two million protesters from around the globe taking to the streets to demonstrate. Monsanto was founded in 1901 and originally produced food additives. In over a century, it has become the world leader in the production of genetically engineered seeds and chemical herbicides. It currently employs over 22,000 people in factories across 61 countries. In light of thousands of people opposing Monsanto on Saturday, a few individuals came out in support of the agricultural giant, gathering outside Monsanto’s headquarters, with banners in favor of the use of GMOs. The pro-Monsanto demonstrators said protesters are spreading “myths” about genetically modified products.